Recently, a CRES client, a real estate broker, received such a subpoena. One of his former agents had been the listing agent for the family home of the divorcing couple. Although there didn’t appear to have been any assertions made against the broker or the former agent, the broker had been subpoenaed. In this case, the ex-wife’s counsel wanted evidence and testimony about the sale and purchase price of the family home and would go to lengths to get it. In the end, the parties decided the broker’s file and testimony were not needed, and he was released from the trial subpoena. If he hadn’t been released, it could have been costly. Subpoena coverage may not be at the top of the list of things you look for in a real estate errors & omissions policy. In fact, you may not have really thought about getting subpoenaed. Our client may not have worried much about it either—until it happened to him. Notice that the broker and the agent hadn’t done anything wrong or had complaints lodged against them. They were being used to support somebody else’s argument. That’s little comfort when you’re faced with a subpoena. If you are subpoenaed, you face the cost of hiring an attorney to help prepare a response or to represent you. If, however, you have subpoena coverage included in your real estate E&O, the only call you need to make is to your insurer. 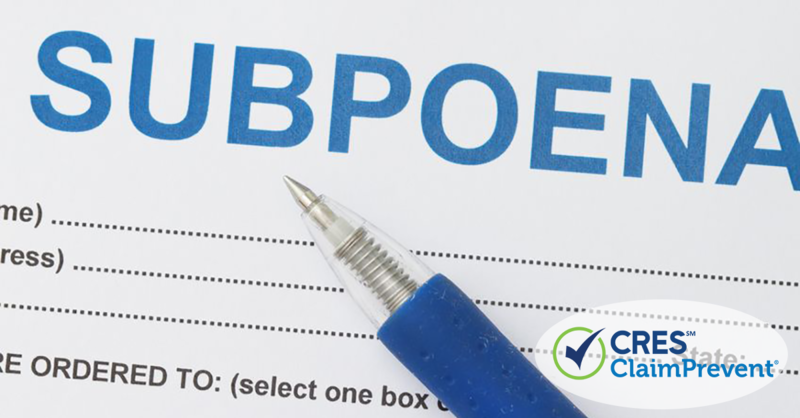 Is subpoena coverage included in your E&O? It’s worth checking. CRES includes Subpoena coverage under our “Broad Form” coverage. For individual E&O coverage, Broad Form is included in most base CRES E&O policies when your state requires real estate E&O coverage (and is optional in other states). For firm E&O policies, Broad Form is an affordable option. With this coverage, your attorney’s fees are taken care of,so you can have an attorney provide advice regarding the production of documents, prepare you for sworn testimony, and represent you at the deposition. If you’re a CRES client and get subpoenaed, contact us within 14 days of receiving the subpoena to activate your coverage. Subpoena coverage could save you up to $30,000. Have a question about subpoenas or another legal issue? CRES clients can call the CRES ClaimPrevent® Hotline 7 days a week. We want to help with any issues that put you at risk. Clients receive a guaranteed response within 4 hours or next business day, with recommendations confirmed in writing. What’s the most expensive legal issue you’ve experienced?